It was a most soulful atmosphere; time seemed to pass effortlessly as if the thin veil between heaven and earth had momentarily lifted. Arjun felt transformed to another state of consciousness where the usual attractions and anxieties of the world lost their lustre, leaving him feeling perfectly calm and inwardly still. It was a rare feeling to be so at peace with the world. At this point, the Master spontaneously asked for any spiritual questions. Arjun vaguely remembered his old desire to ask about his previous incarnation, but in this state of mind it seemed unimportant – even churlish. Arjun just continued to sit in a meditative frame of mind and was amazed at the Master’s capacity to answer questions in his own inimitable way. Alas, even by the next day, the sublime beauty of his previous meditation had faded from Arjun’s mind, and his old thought patterns had risen back to the forefront of his awareness. In his mind, he felt he had missed a golden opportunity, and he inwardly said to himself, he would definitely ask next time. A week later, Arjun was again at the meditation with just a handful of other disciples, and despite feeling a good sense of peace, he was ready to ask. However, the Master never subject himself to any particular routine and this time did not invite any spiritual questions. Arjun thought – fine, the Master is bound to ask next week. However, the next week, again the Master ended the meditation without inviting any questions. It seemed the Master had lost interest in inviting questions from his disciples. Arjun told himself “I should really stop bothering with such a silly thing like knowing my past incarnation.” But, at the same time, the thought still lingered. So the next week, he started to pray for illumination – thinking perhaps the Master would give him a sign in a dream. After a while, he stopped praying and was just concentrating on his meditation. Then to his wide surprise, he had an image in his mind of an old farmer tending a field of rice. Although he didn’t really recognise the person, he had the strong feeling that this was one of his past incarnations. Then the image faded and it was replaced by the image of an old farmer digging up potatoes against a backdrop of a bleak, windswept landscape. Then this image faded to be replaced by that of a fisherman riding over the waves of the sea. Then he saw a soldier in a uniform marching off to war. With this, he got the point – his past incarnations were neither interesting nor illumining. The desire to ask his Master about his past incarnations faded never to return. However, the story didn’t quite end there. A good ten years later, Arjun was travelling with his Master in Myanmar on a spiritual retreat. Arjun was moved by the serenity and calm of the country; with this different pace of life and the inherent spirituality of the people, meditation felt much more natural and effortless. 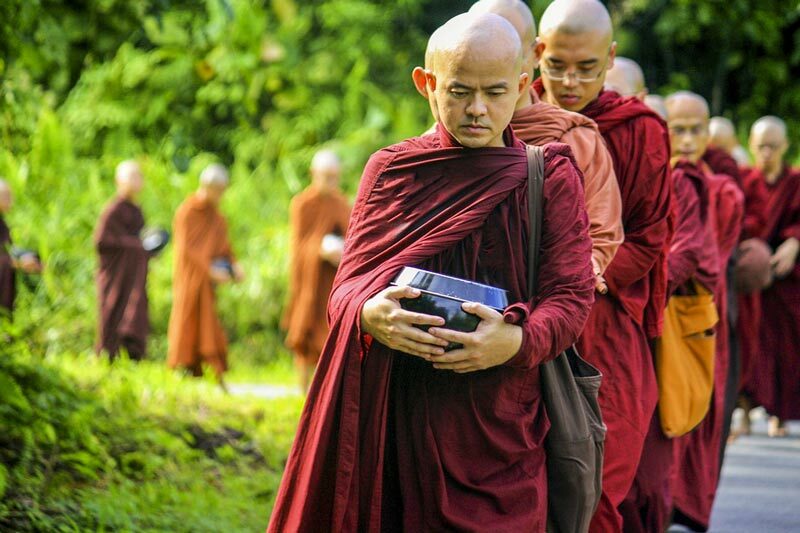 He was also fascinated by the Buddhist monks who, every morning, went begging for food. Rather unexpectedly, the Master initiated a conversation and suggested to Arjun he should go and invite the head monk of a local monastery to come to one of his functions. Arjun followed the Master’s wishes, and he really enjoyed visiting the monks and speaking about his Master’s Path and its similarity with Buddhism. The monks gladly came to visit his Master, and Arjun received much joy from this soulful oneness between different spiritual paths. The next day, with a feint smile, the Master said to Arjun “Perhaps in a previous incarnation you meditated with those monks.” The Master’s smile widened, and then he walked away. Arjun was very happy, though, at the same time, he felt grateful to be on his Master’s Path with its great variety and scope for transcendence in so many different aspects of life. He felt in a monastery, he would not be able to make anything like the progress he was making on his Master’s Path – even if at the same time – escaping to a Himalayan Cave did have a certain appeal!